Image: One local says the northern Flinders Ranges of South Australia has not been as dry in the 34 years he has lived there. The drought is causing underground century-old caves to dry out, cracking columns and stopping stalactite growth. At Princess Margaret Rose Caves in far western Victoria, the clay below the floor of the cave has dried because the water table has dropped. "I'VE NEVER EXPERIENCED THE CAVE SO DRY as it is today. All dampness on the formations and all drips on the formations in this cave are caused from rainfall. Our rainfall is nearly half that of the winter of 2006 and we really haven't got over that yet". Drought is killing wildlife: 'NEVER AS DRY AS THIS' - Years of very low rainfall in the northern Flinders Ranges of South Australia are being blamed for the death of wildlife and hundreds of trees. 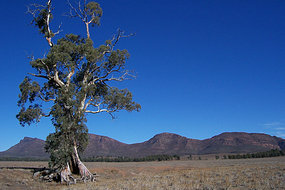 Experts say river red gums can for live for 1,000 years in dry conditions, but hundreds of the mighty trees in the Flinders are dead or dying. Drought conditions are also affecting native animals. "We are finding euros dying around water holes at the moment which is pretty good indicator that they're getting pretty stressed with lack of food. I've been here for 34 years continuously and I've never seen it as dry as this."